Fans play a crucial part in professional sports. They attend the games, buy merchandise and do whatever they can to support their team to keep them going. Many players recognize this and show their utmost appreciation for the fans. Boston, Massachusetts native Jeremy Roenick has always shown his appreciation for the fans that have, and continue to support him year after year. Learning how to treat others at a young age from his mother, Roenick has always understood how important it is to give back to others and to help those that are less fortunate. Thanks to the work of his mother, Roenick was able to understand the importance of helping others early on in his life. He realized that once he was drafted 8thoverall in the 1988 NHL Entry Draft by the Chicago Blackhawks that he would be able to help others out on a different level. After getting the experience early on in his career of what it was like to visit the hospitals, it became almost a routine thing for J.R. He realized that a simple visit to the hospital could help brighten so many spirits in so many ways. “For me, it has always been the best to go to the hospitals because that’s where you get the real hands-on experience with the kids who really need the attention and need to get their minds off of what’s happening in their lives,” he said. 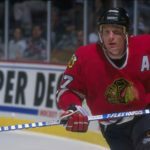 Playing in nearly 1,400 career regular season games with the Chicago Blackhawks, Phoenix Coyotes, Philadelphia Flyers, Los Angeles Kings and the San Jose Sharks, Roenick has spent time in different cities throughout his career and was able to change many lives in every city he stopped in. “For me, I found that it was the San Jose Sharks that did the most in the community – San Jose and Philly probably had the most effect on the community” stated the nine-time All-Star. “The San Jose Sharks, everything they did revolved around the city, revolved around school and revolved around kids,” he continued. While playing in the NHL, Roenick and other players would take it upon themselves to get out into the community whenever they could. Aside from the team initiatives, players enjoyed getting out into the community on their own to help make a difference. Roenick used to hold golf tournaments that would benefit the Make-A-Wish Foundation or the Special Olympics and other organizations of that nature. He and other players in the league realized their popularity and ability to raise money just by showing up to places so they would do as much as they could, whether it was through the team or on their own. If Roenick was the owner of an NHL team, his one rule and message that he would send to his team is that they have to be active within the community. There would be no excuses, it is something that would be mandatory for everyone. One great thing about the NHL is the respect that the players have for each other. When the season comes to an end, golf tournaments and charity events take place that see players from all around the league come together for a good cause. NHLers have charities that they founded or support that other players like to help out with whenever they can. Former NHLer Curtis Brown ended up founding the Aubri Brown Club, a non-profit organization that exists to help families who have lost a child in honour of his daughter who passed away in late 2005 of Sudden Infant Death Syndrome. Being a Boston native, Roenick loved the display of sportsmanship from the Boston Bruins and Buffalo Sabres following the Boston Marathon bombings. Hearing the fans come together to sing the national anthem made it very emotional and made him happy to see the city come together. His playing career may be over, but Roenick is still associated with the NHL and the game that he loves. He continues to show the same respect for his fans that they have shown for him over the years and continues to help others as much as he can, just like his mother taught him.